Cilicia, Tarsus. Satrap Datames, 378 to 372 BC. Silver stater. Size : 21.8 x 23.1 mm. Weight : 10.23 grams. Grade : XF, but just a trace grainy metal. 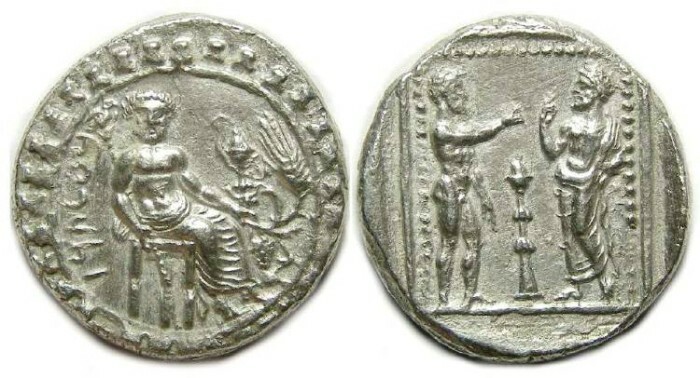 Obverse : Baal enthroned right but slightly facing, inside of a ring of small X's, with an Aramaic inscription to the left, which means "BAAL TARZ". Reverse : Datames standing left raising his hand in veneration towards Ana the sky-god who is pointing toward Datames.